When Tony and I were first dating, we used to eat at a wonderfully low-key Italian place, Jackson Fillmore, with the most delicious zucchini carpaccio, light and fresh with parmesan, toasted almonds and parsley. We’ve tried to replicate it a number of times but never quite gotten it right. So when this recipe appeared in my inbox this morning from Food 52, I thought it was time to try again. I thought the crunch of the raw zucchini and almonds would appeal to my son Eli, who doesn’t like cooked vegetables, and knew the zesty hit of lemon in this recipe would appeal to my lemon-loving son, Ben. Personal preference and our pantry dictated a number of changes to the recipe; we all like almonds, so I used those, slightly toasted, in lieu of pistachios, and we didn’t have any thyme. My sea salt isn’t fine, and my grinder is full of coffee beans, so I just did a rough chop of lemon zest with coarse sea salt, which worked out fine (and the extra has now become my sons’ favorite topping for vegetables and pasta). I don’t have a mandoline, but a vegetable peeler achieves the same effect: lovely fresh ribbons of zucchini. 1. 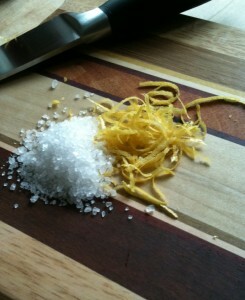 In a small bowl, combine the lemon juice and 1/4 teaspoon lemon zest salt. Add the oil and whisk to blend. 2. With a mandoline, vegetable peeler, or very sharp chef’s knife slice the zucchini lengthwise as thin as possible. Arrange the slices on a platter and pour the dressing over them. Tilt the platter back and forth to coat the slices evenly. Cover with plastic wrap and let marinate at room temperature for 30 minutes, so the zucchini absorbs the dressing and does not dry out. 3. 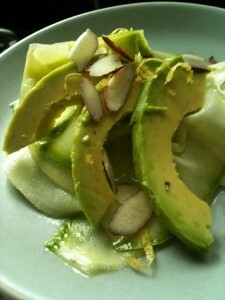 Halve, pit, and peel the avocado, and cut it lengthwise into very thin slices. Arrange the slices of marinated zucchini on individual salad plates, alternating with the avocado slices, slightly overlapping them. Sprinkle with the almonds. Garnish with another sprinkle of lemon zest salt, and serve.